How Does a Spear Gun Work? 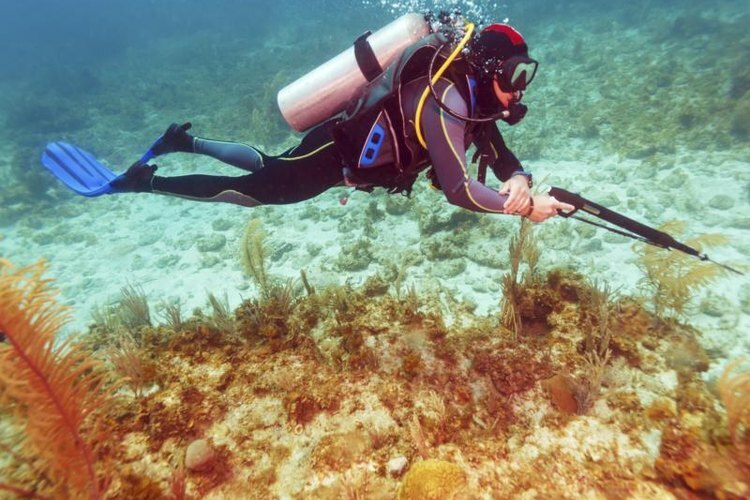 Scuba diver with a spear gun underwater. Most modern spear fishers use one of two types of spear gun. Band-powered models rely on strong elastic bands to fire the spear, while pneumatic spear guns rely on a small quantity of compressed air to send the projectile forth. In both cases, a trigger fires the weapon, by either releasing the bands or discharging a quantity of air. Impaled fish are retrieved via a line attached to the spear, or -- if the water is suitably clear -- by tracking the fish visually. Band-powered spear guns are easier to maintain than pneumatic models are, as they have very few moving pieces and need not be airtight. You can adjust the power of a pneumatic gun, by adjusting how much air is forced inside the tank, but it is easier to adjust the power of a band-powered model. In this case, the spear fisher need only add or subtract bands from the gun. Additionally, while band-powered models are generally silent, pneumatic weapons are noisier. This can startle nearby fish, making it more difficult to achieve success.